To forget how to dig the earth and to tend the soil is to forget ourselves. – Mohandas K Gandhi. A couple of years ago, Jim built several raised beds so that we could grow our own produce to can, freeze, and serve throughout the summer months. Last week, I took a trip to my local garden center to pick out this year’s vegetable plants. I chose Roma tomatoes, cabbage, lettuce, celery, peppers, eggplant, and cauliflower. I also grabbed some of my most often used herbs to plant in colorful patio containers. 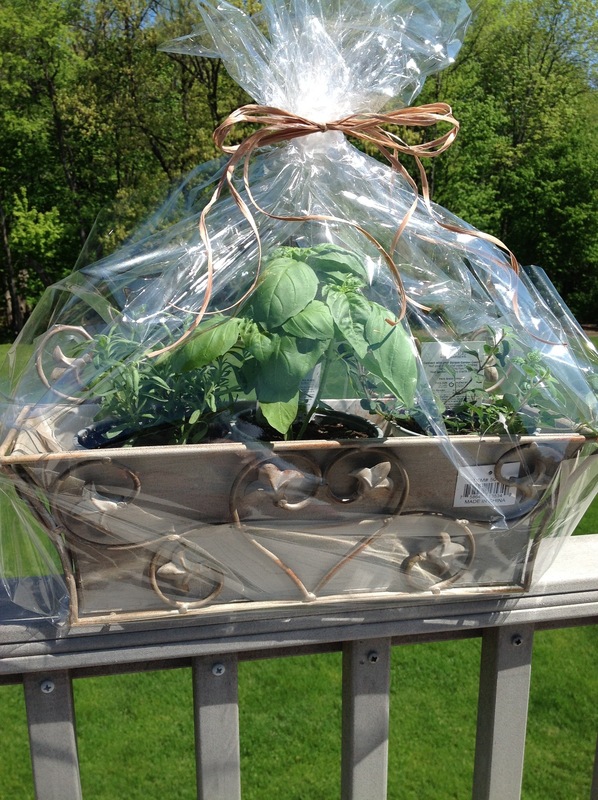 Here’s a clever gift idea to give to a friend that appreciates the taste of fresh herbs and loves home cooking. For the past couple of years, I have made this for my mother-in-law so that she can grow fresh herbs on her condominium deck. Group a few of your favorite herb plants together, arrange them in an attractive basket, bucket, or patio pot. You can add seed packets and gardening tools if you’d like. Wrap the whole thing with cellophane*, secure with twine or raffia and gift it to a friend or relative. Attach a great recipe and you have a winning gift that is sure to please. * Stock up on clear or colored gift wrapping cellophane right after the Easter and Christmas holidays when prices are reduced to as much as 75% off. Store and use for basket and food gifts throughout the year. Lovely! Perfect for gift! I may have to steal this idea.